There’s not much better than coming home from a long day at work, walking in the door and having the house smell amazing because dinner’s ready. At least, that’s my personal opinion, which is why slow cookers (crock pots) are God’s 5- to 7-quart gifts to man. Growing up, I was very lucky food-wise. My mom was a stay-at-home mom and an excellent cook, in my eyes. Due to the fact that she was a homemaker and had more time to prepare meals than many working parents, I was treated to a great variety of meals, which were rarely from something other than scratch. Occasionally the slow cooker would come out for chili or school potlucks or certain recipes that called for it, but it never played a big role in meals. When I met my boyfriend, Sean, and we were both working full-time, he introduced me to the true beauty of the slow cooker. Set up the crock pot and all its contents the night before, store the whole thing in the fridge overnight, set it on to cook on low in the morning as yo leave for work, return home to your house smelling warm, inviting and like pot roast. Plus, the peace of mind knowing that dinner is already cooking and will be waiting for you when you get home is a huge bonus. It’s hard trying to come up with what to cook when all the decision-making energy for the day’s been spent (and then some) at work. Without further ado, I present to you, my latest slow cooker masterpiece: braised chicken thighs with carrots and potatoes. Like I said earlier, prep the whole meal the night before in the crock pot, put it in the fridge, plug it in in the morning and let it go until you get home that night. By that time, the chicken is so tender, you can cut it with your fork or spoon, no knife even required. Also, the recipe’s easy to adjust for any food intolerance or dietary preferences. Paleo? Eliminate the rice and sub in sweet potatoes. Low cal? Cut the rice out and add roasted cauliflower. Easy peasy. Bada bing, bada bang, bada boom, dinner’s ready. Pull out 5- to 7-quart slow cooker, and place onions, potatoes and baby carrots in after it’s been sprayed with non-stick cooking spray. Top veggies with chicken broth, thyme and garlic. Lay chicken thighs flat and sprinkle both sides with pepper, paprika, Tony Chachere’s and garlic powder. Roll the thighs back up and place them in the slow cooker on top of the vegetables. 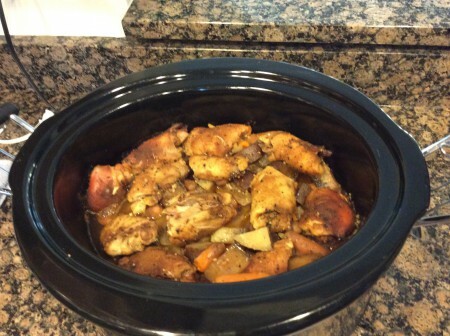 Cover the slow cooker and cook for 8 hours on Low or until chicken is done. Optional: If you’re making rice to add, cook rice according to package directions. 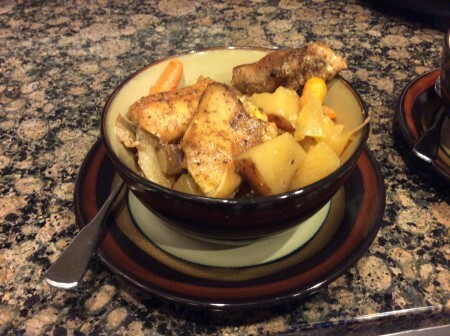 Divide rice evenly among six bowls and top with the braised chicken, potatoes, carrots and onions. This is what the slow cooker looked like after 8 hours of cooking. That’s hearty!